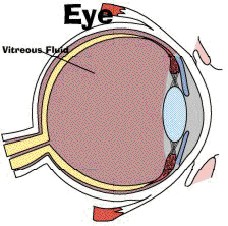 fluid that fills the inside of the eye. of another underlying disease state. blood vessels within the eye. over time. Unfortunately, it may take months for full visual recovery from a vitreous hemorrhage. vitrectomy is a surgical procedure that removes the vitreous gel and the blood from inside the eye. resembles the natural vitreous fluid in the eye. Recovery from the procedure will take up to 6 weeks and complete vision recovery will take longer. © Copyright 1999 Dialog Medical, Inc. All rights reserved.